In America, some will surprisingly find embedded deep into the younger culture the desire to accept new-found fashion statements as well as new innovation. With the introduction of Fiat in the states, not only has the young culture accepted what is considered as a new ‘statement’ of rolling fashion, but every other age group has embraced the Italian brand with curiosity being the initiator. The curious and inquisitive minds of just about every age group have taken on yet another endeavor to welcome the all-new Fiat 500L, dubbed the 5-Dorr Urban Utility Vehicle . We first had the Fiat 500 with a multitude of various trims already claiming its acceptance on US shores. 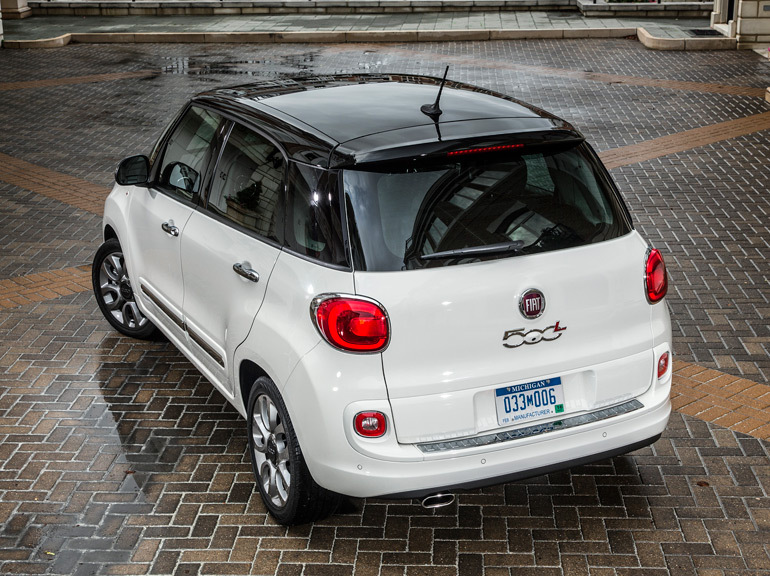 The joint efforts of Chrysler and Fiat’s US synergy now birth the larger 5-door and 5-passenger Fiat 500L. 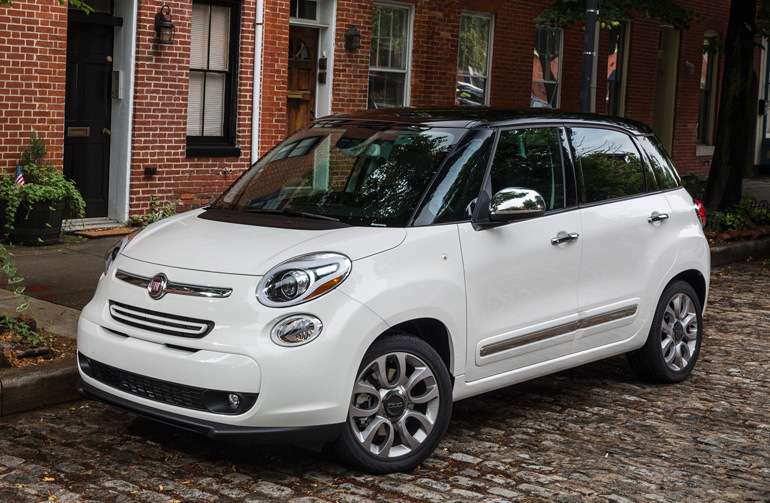 The all-new 2014 Fiat 500L literally builds upon the foundational design of the current 500 with a stretched wheelbase, 5 doors, an economically fit drivetrain and crossover-like versatility. Having had the chance the drive the new Fiat 500L I was taken back to my preconceived thoughts of older European “larger” Fiats that were not so appetizing to the eye. For the new Fiat 500L, it brings about a face that a mother can love as well as long-time friends – but not without expressing its self-proclaimed cute aspects in your own choice words. 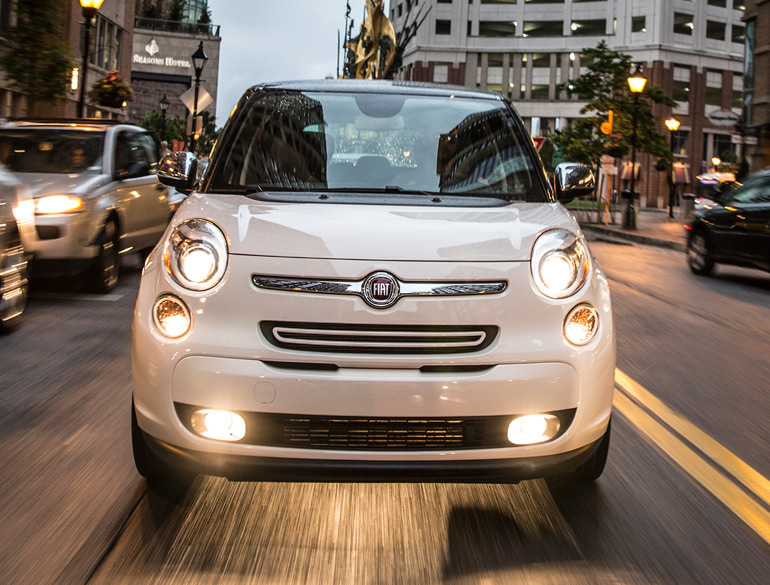 The new Fiat 500L isn’t ugly; it just has a unique personality. 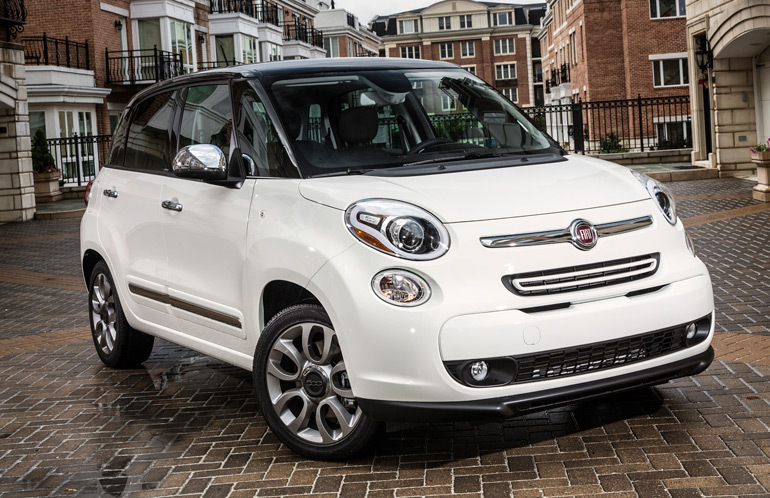 Those who have already become acclimated to the current Fiat 500’s looks will have no qualms with falling in love all over with the 500L, especially when you get a good look at its larger bodily dimensions. The new Fiat 500L, to most, won’t fall into an obvious automotive category in America, though it will appease those who seek something different yet large enough to cutely transport humans and stuff. Basically, you can call it a wagon and avoid getting frowning faces from all of your friends. A total of 4 trim levels are available to choose from for the new Fiat 500L – all having the same engine starting with the Pop version getting a standard six-speed manual transmission, 16-inch steel wheels, tilt & telescoping steering column, cruise control, power-heated exterior mirrors and a Uconnect 5-inch touch screen LCD for operation of the audio system and Bluetooth functions. The next trim is the 500L Easy adding the choice of 3 roof colors, 16-inch aluminum wheels and availability of the 6-speed twin-clutch automatic transmission as an option. The Fiat 500L Trekking trim adds 6 exterior color choices and unique satin-silver body-bumper moldings and door handles. The top-range 500L Lounge trim adds the automatic transmission as standard equipment and you get chrome exterior mirrors, door handles and body side molding inserts. The Lounge version, as found on my test vehicle, opens up the availability to add on a dual-panel power sunroof encompassing most of the roof itself. One thing to note is the pricing for each trim increments in $1,000 levels with the exception of the Lounge costing about $3,000 more than the Trekking trim. 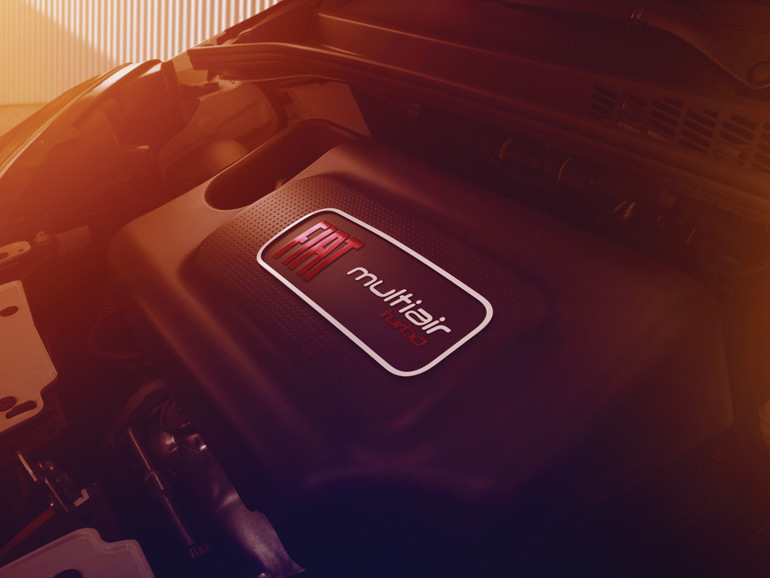 Molding the Italian name into American lives, the new Fiat 500L attempts to avoid disappointment by sharing the same engine with the pocket-rocket Fiat 500 Abarth featuring the 1.4-liter MultiAir Turbocharged 4-cylinder engine producing 160 horsepower and 184 lb-ft. of torque. Already proving to be the right fit for enthusiasts in the new Fiat 500 Abarth, the turbocharged engine gets the Fiat 500L moving in the right direction but only after a sluggish start. The new Fiat 500L’s performance tends to suffer from a bit of turbo lag combined with the slipping of its automated clutch found in the Six-Speed twin automatic clutch transmission. The dual-clutch transmission, serving as the standard automatic transmission for the Lounge trim level, proves to be a good compromise of economy and aid in performance for the turbocharged engine. Though, it does put a damper on acceleration out of the hole considering the Fiat 500L has 3,203 pounds to move around. Once things get going there is not much hesitation as the performance seems to come to life and the 1.4-liter turbo 4 begins to sing a harmonic buzz while the speedometer steadily climbs. The direct gearing of the dual-clutch transmission over a conventional automatic with a torque converter is a wise choice to extract every bit of power through the flywheel and to the front wheels. The payoff is more on the economical side instead of sheer acceleration where the 500L is EPA-rated at 24 mpg city and 33 mpg highway. Expect to reach 60 mph from a dead start in just over 8 seconds. 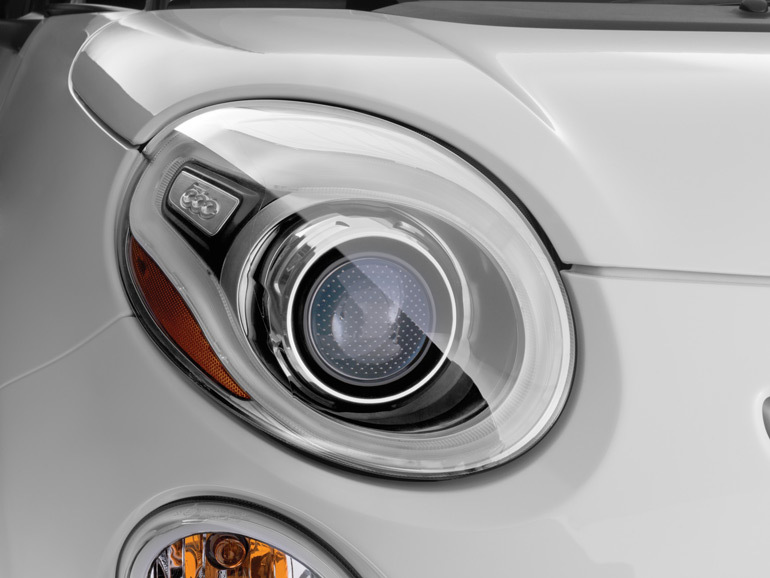 As you would expect from the looks alone, the new 2014 Fiat 500L won’t be proving much of a point from a stop light. 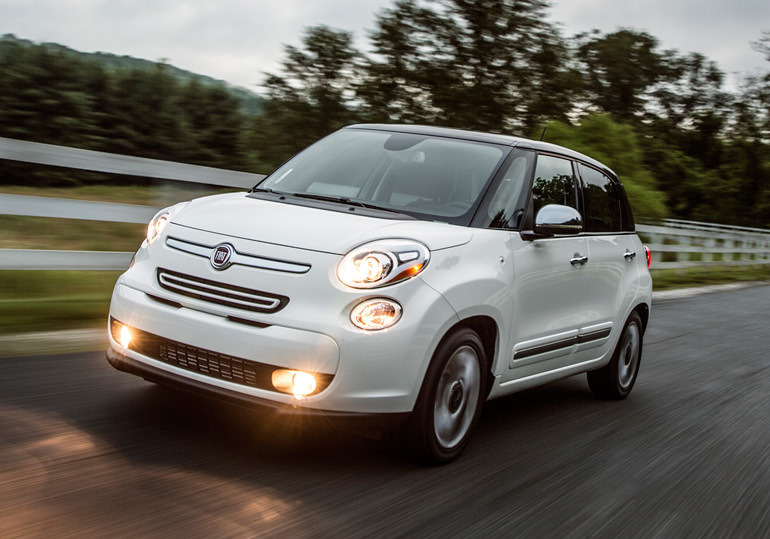 Surprisingly, the road-going assurance experienced from the Fiat 500L is what you would expect driving a compact car with a long wheelbase and compliant suspension. Turn-in is indicative of a small bus and somewhat slow yet compensated with the easy effort of the electric steering rack. The balance of the Fiat 500L is, dare I say, almost like the MINI Cooper Countryman Wagon but with less panache. Overall ride quality is really good with a nice balance between a sporty attitude within law-abiding limits and a comfortable transition over rough pavement. 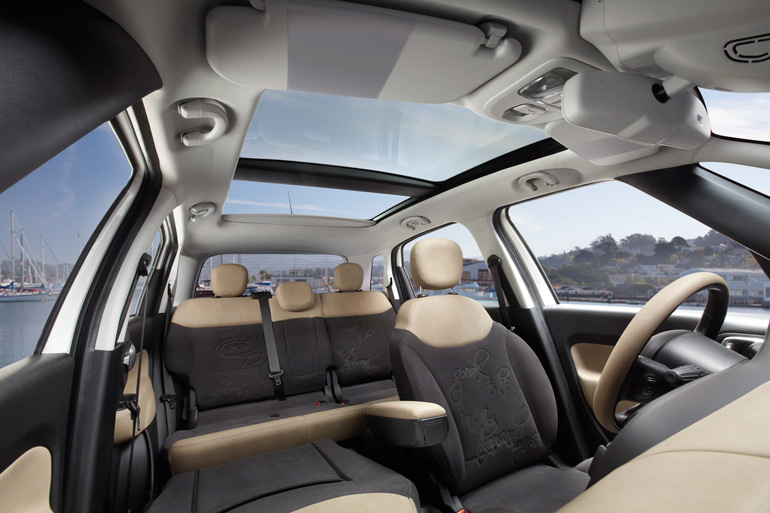 The inside of the new Fiat 500L gives you a slight disconnect from the world of driving an Italian vehicle on the streets of the USA. Normally, an Italian automobile does everything to deeply connect you to the road and its ‘exotic’ interior. The new Fiat 500L gives off an ore much like the smallish Fiat 500 in that you have once nicely accented color scheme laced with matt-finished black plastics. From a reasonable distance it all comes to together visually but then has a slightly different mood when you test its true functionality and ease of use. I don’t doubt that any young person would easily become familiarized with the Fiat 500L’s reaching-for-simplicity dashboard. Some of the controls lack familiarity in their positioning, which can lead to more confusion that it should be in such an over-simplistic vehicle. The seating is suggestive to that of the best school bus seats you ever sat your posterior in – they have a minimal amount of bolstering and the rear 60/40 split setbacks are about as flat as a cutting board. This is not to say the seats are terrible, just during my drive in the city I didn’t feel the love surrounding my body as a proper driver and passenger’s seat should share. 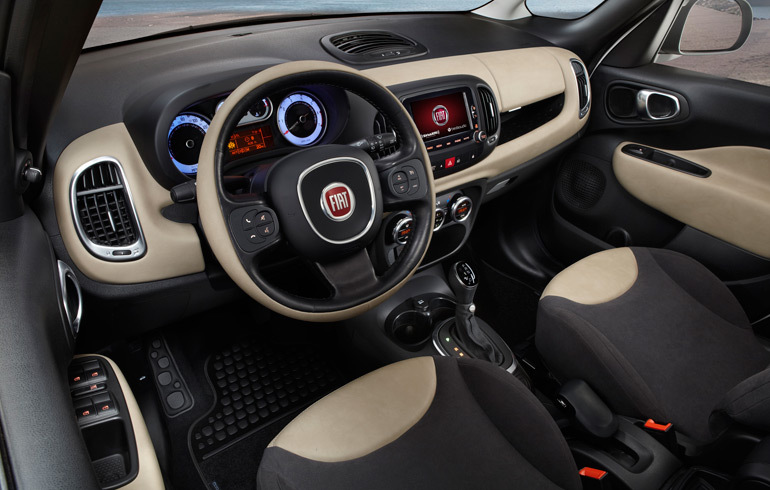 On the plus side of the new Fiat 500L’s interior, there is more room to work with than you would think just by its perceived exterior dimensions. Additionally, the optional Beats Audio system with 6 speakers and subwoofer sounded better than expected with clear high and rattle-free low bass tones. 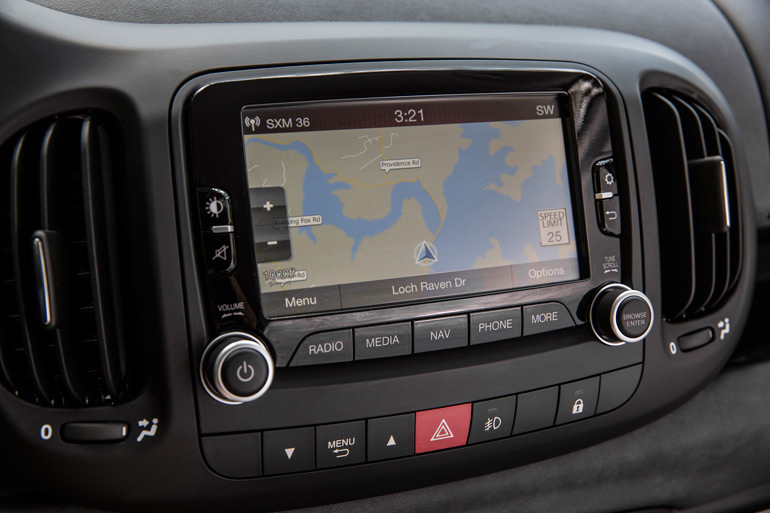 The infotainment unit fed through a high-resolution 6-inch LCD touch-screen is a slightly scaled down version of the system found in other Chrysler, Jeep and Dodge vehicles, which use a larger 8.4-inch screen. The screen nicely integrates a few vehicle settings, GPS navigation mapping, audio controls and viewing of the rearview back-up camera. Probably the big benefit of the system aside from its useful features, is it being available as part of a $1,745 value (free) Premier Package on my Fiat 500L Lounge trim. The few options found on my 2014 Fiat 500L Lounge account for about $2,450, which includes 17-inch painted aluminum wheels, Beats Audio system and a black Nero Roof with a large integrated power sunroof. Including the $800 destination charge it brings the as-tested price to $27,445. With all things considered, the Fiat 500L starting at just $19,100 is still a good value when you factor in its economical drivetrain, versatile cargo room, and its acquired-taste charming looks.